About a month ago or so I was contacted by Gimlet Mommy of the Entertaining House asking me about what reminds me of fall most My First Answer was Thanksgiving and my second answer was having a Tailgating Party. So Gimlet Mommy asked that I do a post on Tailgating and all of the fabulous food that I would serve at a event like this. 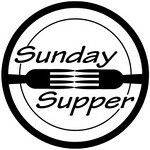 We served some familiar dishes that a lot of you have made from "Cooking Underwriter" in the past, plus some new appetizers, salads and side dishes. The Mrs. of One Fabulous Mom and her husband were in attendance too and we had a blast together as usual. Come with us on our journey of tailgating with fabulous friends and don't forget to visit their fabulous blogs too. This was are menu for our tailgating event. We had a fabulous time at the football game after our tailgating adventure and fun was had by all. By the way University of Southern California, Trojans won and walked away with a victory. The score was 17 University of Southern California, and 14 Virgina. OneFabulousMom’s Famous Brats made from her husband's special spices, are to the left. TIP OF THE DAY: Don't forget your spray bottle of water because the bacon grease will flame up the fire on your barbecue. Made as directed from box except I made substituting the butter for apple sauce equal parts. Then I frosted and Put the Gluten Free Sprinkles as a topping. Plus I made in Cupcake lined tins for easy transport and display. So all of the recipes have links to them! I hope you enjoy the fresh quick and easy food recipes as much as we did. We made the Summer in a bowl, The Chicken Caesar Pasta Salad the night before. 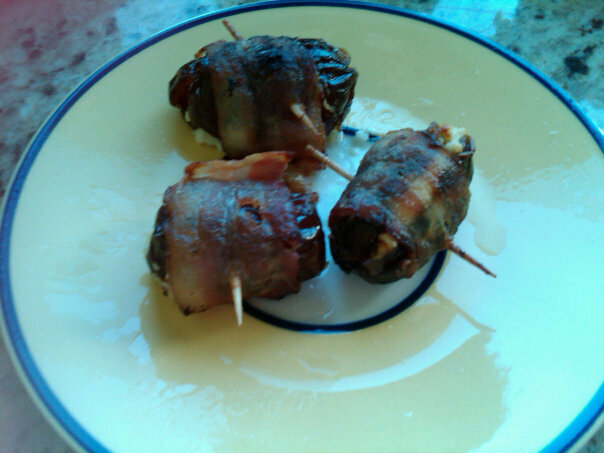 Then that Morning of the tailgate we assembled the Goat Cheese Stuffed Dates Wrapped in Bacon and The Grilled Peppers and Onions; we then cooked at home then heated up on the grill before serving. We also Grilled the Brats and Sausage at the sight but assembled the Sweet Italian wrapped in Bacon and the Alfredo Corn on the Cob at home the night before.A lot of these foods can be done ahead of time and are fabulous on the grill. Happy Tailgating! Bon Appetite and Happy Tailgating!! What a great spread of food. Good idea for a day out with some friends. Mmm, looks like a lot of great food! I was drawn to your site when I saw it on the Foodie Blogroll, because I'm an underwriter with a cooking blog too! Please follow me to By pressing the follow button and please make a comment on foodie blogroll. I too am an ex-underwriter and I love to cook. However, I need to start with a recipe. You have the talent to make things up - excellent!